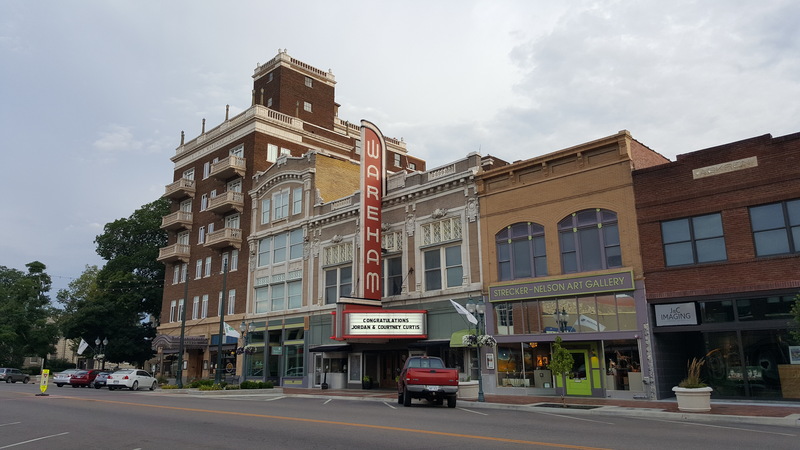 Downtown Manhattan, Kansas: vibrant, tasty, and walkable. Saturday, I walked in the early morning with heat rising towards 105 degrees. It was too humid for me to run. Walking means I take my phone and its nifty camera to capture moments of a given day and place. I’m motivated knowing we’ll never be able to meet every interesting person in every interesting place, but we can share photos and stories – introductions – like this one of my own Bedford Falls. Bedford Falls is the fictional movie town of “It’s a Wonderful Life” featuring Jimmy Stewart and Donna Reed as George and Mary Bailey. It is a vibrant town full of kind and everyday remarkable people. In Bedford Falls, folks know you and your history better than they know world news. These are people who pull together in tough times. 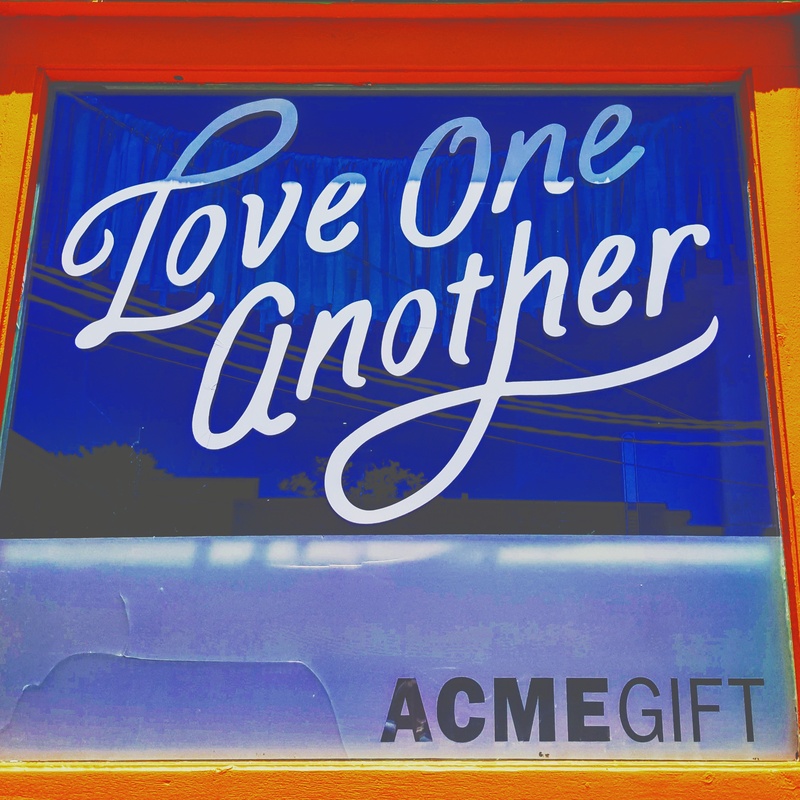 ACME’s window of wonder…always changing. Manhattan-area folks get involved where they can. Neighbors look out for one another and help chase down the dog running free. Chickens have been returned to backyard roosts. Yards are mowed and snow shoveled by strangers. You’ll see local teachers and professionals sharing and repairing Green Apple Bikes, the local bike sharing program. I know of a gentle old woman who hosted homemade ice cream socials in her yard each year before school resumed. Her name was Martha and her beau had perished in a long ago war. She helped raise nieces, nephews, kids, and community. Her summer garden consumed the corner lot. We loved her so. My instagram feed follows my feet around Manhattan and – in looking at it Saturday – seems to be a love letter to Kansas from a “mostly-Kansan” transplant. It features three seasons of Downtown Farmers’ Market, the encouraging word ACME gifts paints on its rear window, running routes, kayaking waters, travels around the county and beyond. Oliver, the feline security at Dusty Books is no stranger to the photo feed. I adventure often around the area and only have skimmed its limestone surface. Saturday as I rounded a corner and snapped the first photo above, I realized how Manhattan is like my own Bedford Falls; a safe place to invest in people, their ideas, and spaces. Shared history. Continuity. Community. Friends and family. These are the things I longed-for in my hop-skotching childhood between Bavaria and Fort Riley. I feel a profound gratitude to have found such a place and a deep responsibility to do what I can to further connect people to one another, new ideas, and to this good imperfect place. 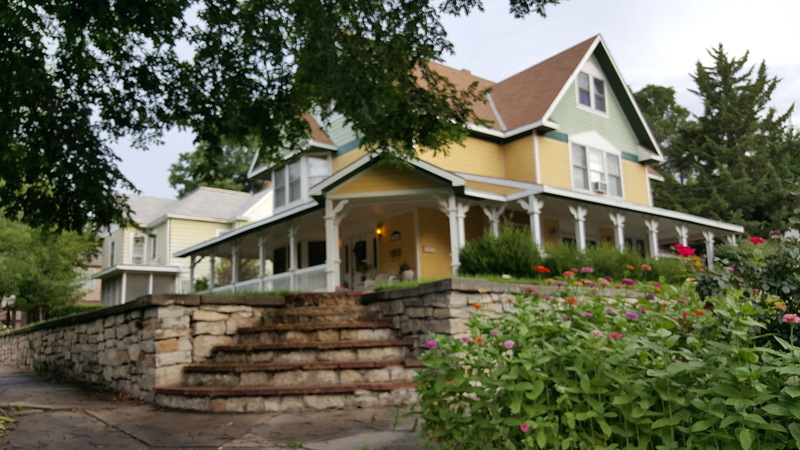 Home with zinnias, traditional Manhattan, Kansas, neighborhood. As I walked, I began to think of this nudge towards community development as being of the same motivation as my long-desire to be a school librarian; a desire to help people learn, grow, and imagine. Help them get to the places of their best dreams. Remind them to bring people forward as they go. Cheer them on. Celebrate. Build a community for every one. We don’t need to give it all away to work with a humanitarian group to build community. It takes derring do… to stay in a place, to leave, and to return. Wherever you find your Bedford Falls, I invite you to become involved in growing community, reading with kids, calling friends you haven’t seen in a while, thanking the kid behind the cash register at Chipotle’ during the lunch time rush. In these and so many other things, we can do good and possibly make history’s retelling of our town-story a little kinder, more connected, safer. We can do this wherever we are. Carry on your good work Allie the Librarian-in-your-own-way, helping people (including me) to learn, grow, and imagine. I to am experiencing my own type of it’s a wonderful life. Meeting birth families of two children. Traveling cross country and discovering that what I want is more who I want. Our family live mostly in Kansas. A few scattered here there in wonder. I get the rare chance of seeing my children interacting with the birth families that have not seen one in ten years next month, the other child shares a birth parent and will only really see one side of the families. Thank you Allie for being in my Bedford Falls Always. It’s a Wonderful Life is my absolute favorite movie. I love the characters and the story. Every Christmas I watch it with my babies (who are not babies any longer). Kay is retiring at the end of this year and I am fairly flexible so a trip to your own Bedford Falls to see you and Mimi would be such fun!